Get to know the Airship dashboard interface — go.urbanairship.com. The dashboard is where you create and access the containers, or projects, that will contain the settings, certificates, reports, and other details related to your messages and wallet passes. A list of all your messaging and wallet pass projects. An individual messaging or wallet pass project, after you've opened it from the list of all your projects. Almost everything you do with Airship, including creating messages and pass templates, happens inside a project. To learn more about projects, see: How Messages and Passes Work. Each messaging project pane displays its name, environment, and channels. Each wallet project pane displays its name and pass type. Click a pane to open a project. If you have more than eight projects, up to four of your most recently accessed projects appear under the Recent header. Recent projects are not shown when sort, filter, or search are applied. Search: Enter a complete or partial project name. Sort: The default view is sorted by creation date, newest projects first. Click Name or Date Created to sort further. Click again to toggle ascending/descending order. Filter: Click Owner to display projects you own and Team to display projects you have non-owner access to. For more information, see Manage Messaging Project Access. Channels: Select from the dropdown menu. Pass Types: Select from the dropdown menu. Companies: Select from the dropdown menu. Click the Airship logo in the header to return to the list of all your projects. Click the user icon to access your account menu. 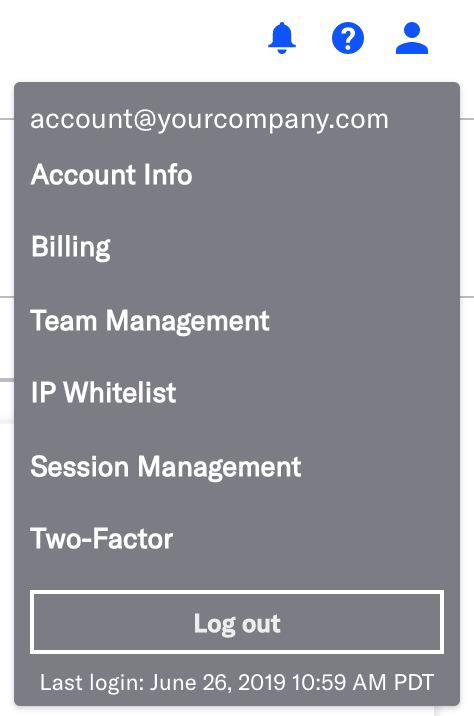 To access account-related information, click the Account menu icon in the right side of the Airship dashboard header. Not all menu items appear for all users. The date and time of your last login are shown at the bottom of the menu. The same information is also shown in the page footer, along with your username and IP address. The time is your browser's local time. After five unsuccessful login attempts on go.urbanairship.com, the account is locked for 30 minutes, and a notification sent to the account's email address. End your session by clicking the account menu icon in the upper right corner of the screen, then click Log Out. Want to end another Team Member's session? Open Manage User Sessions from the Account menu. The Error Console is located in right side of the page footer. It provides a list of errors related to your project's service settings, the implementation of your project, or any push notifications that you've attempted to send. Click Error Console to expand the console and reveal any errors. Header: The header shows the project icon, name, and environment type. To switch between your six most recent projects, click the arrow next to the project name, then select from the list. A link to return all your projects is at the bottom of the list. You can also return to all your projects by clicking the Airship logo at the top of the page. To create a new message, click Create, then choose a workflow. See: Message and Workflow Types. Messages has your message history, message templates, logs, tools, and more. Audience contains information about your app or website users, and tools to help you effectively target your messages. Reports provide in-depth analysis of your project's messaging use. Settingsis where you set up and configure your project. A mobile wallet project has page elements that persist no matter which project screen you are currently on. Header: The header shows the project name and the pass type name and icon. To switch between your six most recent projects, click the arrow next to the project name, then select from the list. A link to return all your projects is at the bottom of the list. You can also return to all your projects by clicking the Airship logo at the top of the page. To create a new template, click New Template, then choose a template type. See: Project and Template Tutorial: Create a Template. Templates are the basis of the graphic interface of the Wallet template editor, and they control the layout of fields. A project can have multiple templates. Reports show activity per template. Triggers let you display content based on location or date. Segments are used to update passes based on user tags. Settings is where you manage the project's details, barcode, certificates, and Associated App IDs. The project's API key and secret are also available in the Settings menu. Pass Counts: These metrics reflect the current count of passes rather than net pass activity. For example, if a user adds a pass, then removes the same pass, then adds the pass again, the Passes Installed count increases by one, while the Passes Removed count stays constant. Passes Created: The pass has been created but has not yet been added or deleted. Passes Installed: The pass has been installed by the end user and has not been removed or deleted. Passes Removed: The pass has been removed by the end user and not deleted. Deleted passes are removed from the Wallet platform but remain on the end user's device. Only end users can remove the pass. If a pass has been deleted, you will not have the ability to send any updates to the pass. The Created metric only tracks Apple Wallet users. Templates Summary: The summary is a per template breakdown of the same metrics in the pass counts above. The template name is followed by its ID and platform. Click a template name or the histogram icon at the end of a row to open its Activity Report.